Armband iPhone X/iPhone 8 Plus/ 8/7 Plus/ 6 Plus/ 6, Galaxy S8/ S8 Pl us/ S7 Edge, Note 8 5, Google Pixel, 360° Rotatable Key Holder Phone Sports Armband Phone Holder by iRunme at Got Busted Mobile. Hurry! Limited time offer. Offer valid only while supplies last. IRunme sports wristband with 360°rotatable silicone phone holder Exercise companion with easy access to phone calls, messages, music, apps, map etc. Exercise companion with easy access to phone calls, messages, music, apps, map etc. - Highly elastic and adjustable Velcro strap fits for most different size of wrists. At iRunme, we back this armband with 12-month warranty and within 24 hours friendly customer service. 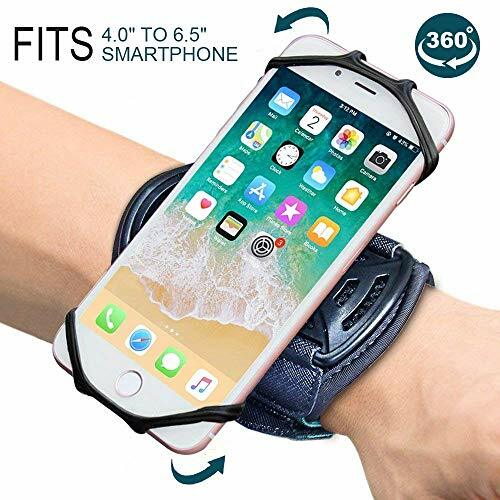 COMPATIBLE: The armband compatible for 4.0"-6.5" cell phone, perfectly fits iPhone X iPhone 8/8 Plus, 7/7 Plus, 6S/6S Plus, 6/6 Plus , Samsung Galaxy S8, S7 edge, S6, J7. ROTABLE: The phone armband is innovative 360°rotation design, make you much more convenient to adjust the angle and find suitable position for you to check phone messages or take a photos without take out the phone from armband as those old ones. If you have any questions about this product by iRunme, contact us by completing and submitting the form below. If you are looking for a specif part number, please include it with your message.